Drones in agriculture are a big boon to farmers. They carry the potential of completely transforming and revolutionizing the farming and agriculture industry. 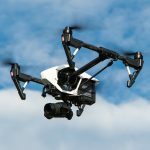 Agricultural drones are high-tech systems that allow farmers to do things faster and more efficiently than ever before: soil health scans, monitoring crop health, applying fertilizers and watering the fields, even tracking weather and estimating yields, and then collecting the data and analyzing it for prompt action. In short, drones can mechanize every step of farming, reducing the costs of human errors and enabling farmers to react quickly to threats (such as drought conditions and pests), helping them maximize income and returns on investment in the end. Welcome to Remote Sensing Technologies, education overview. We are building a knowledge base and technology infrastructure to facilitate collaboration between plant scientists, engineers, growers and government. Our goal is to help scientists and farmers use manned and unmanned aircraft to increase crop yields, reduce production costs and prevent exposure to tedious or hazardous work environments. Specifically we will – ♦ Develop, test and disseminate new methods for inspecting and treating plants, soil and water using unmanned aircraft; ♦ Promote commercialization of unmanned aircraft systems and services unique to agriculture; and land management. ♦ Provide a training program for safe, ethical and cost-effective use of unmanned aircraft as it relates to agriculture and sustainable land management. To simplify the data that is collected in aerial imagery systems, a reduction process is needed, in this case called Feature Extractions. Just as professional photographers start with many photographs and then cull them down to the most relevant, feature extractions are simply a digital extraction of redundant data. Fixed wing platforms are a design form that has been around since even before the Wright brothers. Prior to 1903 they were in the form of gliders. Wilbur and Orville Wright found the way to add an engine and powered flight entered the history books. Many of today’s fixed wing drones have taken on a different shape. The most common being reminiscent of the shape of a boomerang. Computer technology has allowed manufacturers to eliminate the tail section and now fly fixed wing tailless UAVs. Production Forests: The practice of forestry with the object of producing maximum quantity of timber, fuel wood and other forest produce is called Production Forestry. The production forestry can be further classified into: Commercial Forestry: Commercial forestry aims to get maximum production of timber, fuel wood and other forest products as a business enterprise. Industrial Forestry: Industrial forestry aims at producing raw material required for industry. In Extension Forestry: Extension forestry which includes the activity of raising trees on farm lands, villages wastelands and community forest areas and on lands along the sides of roads, canal banks and railway lines (Anon., 1976). More recently, there has been emphasis on dynamic land use planning and efforts are made to maximise production on farmlands under agroforestry. Agro-Forestry: Agro-forestry has been defined as a sustainable land management system which increases the yield of the land, combines the production of crops and forest plants and/or animals simultaneously or sequentially on the same unit of land and applies management practices that are compatible with the cultural practices of the local population. A Geographic Information System (GIS) is a framework for gathering, managing, and analyzing data. Rooted in the science of geography, GIS integrates many types of data. It analyzes spatial location and organizes layers of information into visualizations using maps and 3D scenes. ​With this unique capability, GIS reveals deeper insights into data, such as patterns, relationships, and situations—helping users make smarter decisions. Geographic Information System (GIS) is a framework for processing, and understanding information that is harvested from maps and aerial images of any type, but most commonly satellites and UAV. If you send us an email at Info@rst1.net or call us toll free at 855-677-7070, we will design a program to show you how you can increase your yields and reduce expenses. Or if land management is your area of expertise, we will develop a process addressing the goals of sustainable land management. multi–level, multi-stakeholder involvement and partnerships at all levels – land users, technical experts and policy-makers. Rotary wing platforms are a design form whose first commercial helicopter was built in Germany in 1936. However it wasn’t until 1942 that Igor Sikorsky began mass production of his improved design and produced 131 of his first model. Those same basic characteristics have now been incorporated into our drones. The most popular designs being the four and six bladed drones. Satellite imagery are images of Earth or other planets collected by Imaging satellites operated by governments and businesses around the world. Satellite imaging companies sell images by licensing them to governments and businesses such as Apple Maps, Google Maps and Remote Sensing Technologies, LLC. There are over a thousand satellites in space, observing us, and the land that we call Earth; and an increasing number is continually added. That not only means more data is being collected, it also means more data can be analyzed. If only you can tap into that data. Most satellites record new data an average of 4 times a month. It’s a lot of information to sort through, but with the right tools it can be very useful to you, especially if you are in agricultural business or land management. Believe it or not, this information is consistent and readily available through Remote Sensing Technologies. It is collected over routine periods of time, giving great historical perspective. Because it is becoming so common, the price has reached affordable levels, allowing for an affordable and sustainable monitoring program. Infrared thermography (IRT), thermal imaging, and thermal video are examples of infrared imaging science. Thermographic cameras usually detect radiation in the long-infrared range of the electromagnetic spectrum (roughly 9,000–14,000 nanometers or 9–14 µm) and produce images of that radiation, called thermograms. Since infrared radiation is emitted by all objects with a temperature above absolute zero according to the black body radiation law, thermography makes it possible to see one’s environment with or without visible illumination. The amount of radiation emitted by an object increases with temperature; therefore, thermography allows one to see variations in temperature. When viewed through a thermal imaging camera, warm objects stand out well against cooler backgrounds; humans and other warm-blooded animals become easily visible against the environment, day or night. As a result, thermography is particularly useful to the military and other users of surveillance cameras.